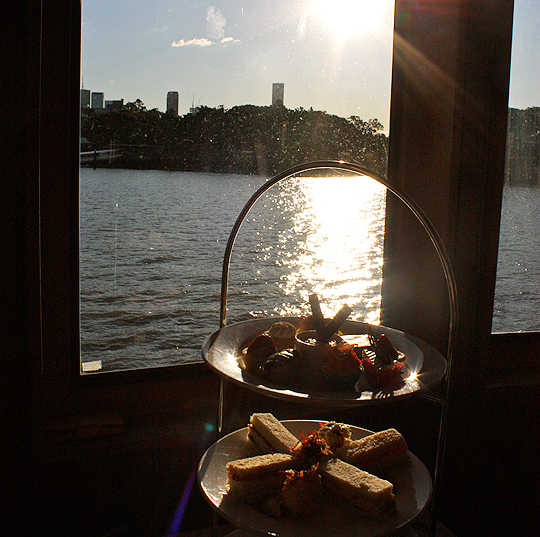 I couldn’t think of a better way to spend a Saturday afternoon than drinking tea and taking in the views of the Brisbane River. 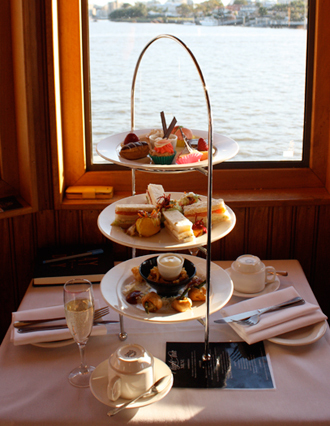 They say Queensland is beautiful one day, perfect the next and despite a recent cold-snap that had most of Brisbane shivering – I couldn’t think of a better way to spend a Saturday afternoon than drinking tea and taking in the views of the Brisbane River. 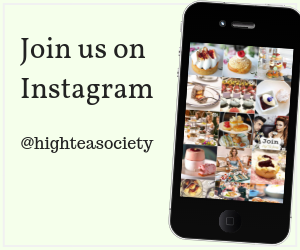 And of course, the best way to do this would be from a boat where the High Tea Society had the pleasure of taking high tea with Kookaburra Showboat Cruises. 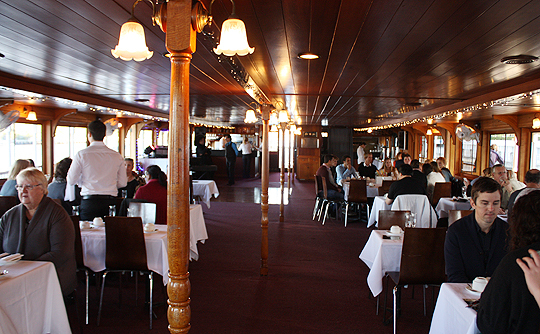 As we entered the classic looking timber paddle wheeler we were greeted at every turn by the boat’s lovely staff. While the afternoon got off to a rocky start with my glass of Grand Region Sparkling Cuvee almost being served to me in a dirty glass things quickly took a turn for the better. The view from our table was incomparable. Despite having lived in Brisbane for more than a year, this was a view of Brisbane I had not seen. As we sat sipping our free-flowing sparkling wine and the pianist entertained us on the electric piano, I could feel myself succumbing to the ambiance of cruise. I was thoroughly relaxed and as I looked around the room, I could tell the rest of the guests were too. The cruise’s MC introduced himself to the room and I soon learnt that many of the guests were from out of town, and I understand why. 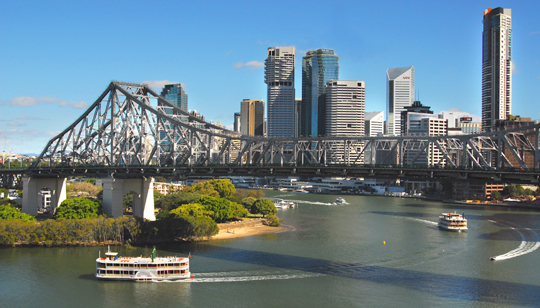 This cruise is perfect for tourists – it’s affordable, relaxing and you get to enjoy some of the best scenery Brisbane has to offer. 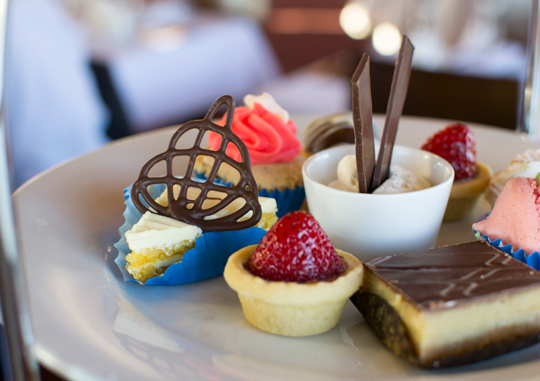 It wasn’t long before the three-tiered high tea was served. 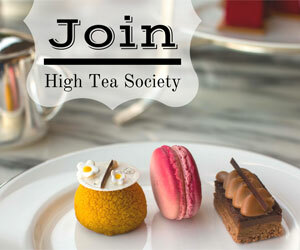 For high tea connoisseurs, this is not your traditional high tea. 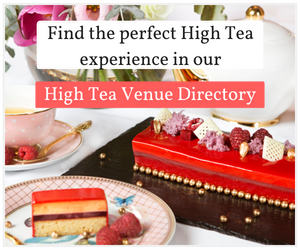 While delicious in it’s own right, you’re not going to find it served on fancy china or a wide selection of teas to choose from. 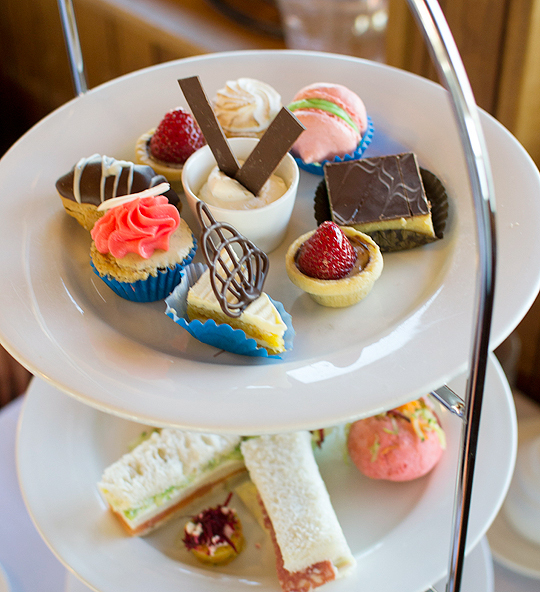 But what you will find is the kind of high tea you can take your bloke to and he won’t complain. Did I mention the sparkling wine was free flowing? 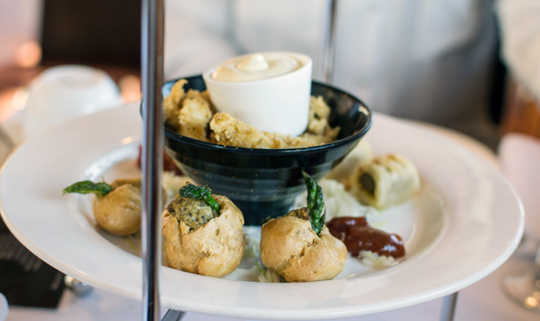 While there were no scones with this high tea, there was calamari. Despite not being traditional, the crispy lemon pepper calamari was a pleasant surprise on a chilly day. The bottom tier also had chicken and lamb sausage rolls and chicken, asparagus and mushroom puffs. The savouries just kept going. A mini pumpkin roll with carrot and beetroot, a mini beetroot roll with sweet potato and a veggie frittata with Danish feta and beetroot were also served. I found the mini rolls a little dry and bland but the rest of the savouries made up for this. For me the sandwiches were the highlight. The cucumber, ham, salami and Dijon aioli was delicious but for me, the smoked salmon, cream cheese and lettuce sandwich was the winner. 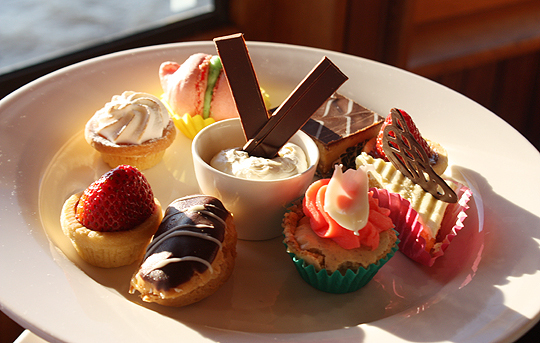 Just when I thought I was going to be able to dig into the sweets – the bottom tier of calamari and pastries was replaced with a second serving. Thank goodness I had a guest to help me guzzle it all down. 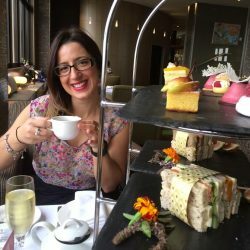 For the sweets we were served caramel slice, chocolate éclair, midori macaroon, strawberry tart, lemon meringue tart, almond vanilla bean cake and orange and almond cake – like I said, I’m glad I had help to eat it all. Highlights included the almond vanilla bean cake and caramel slice. 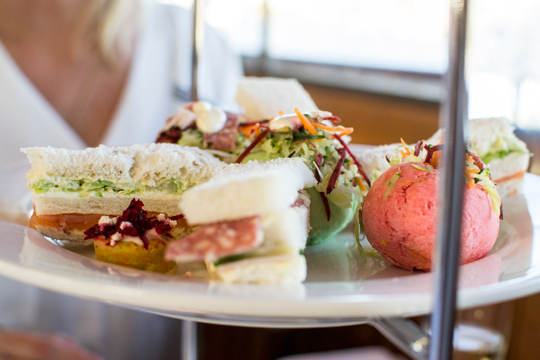 While this isn’t the most fancy high tea I’ve had the pleasure of reviewing, it was the most fun and as far as views go the Kookaburra has the lion’s share. $55 per adult, $49 concession, $25 children (4-12), infants free.